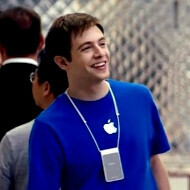 Internal sources from Apple's retail store business are revealing that a new perk is heading their way from Cupertino. After introducing things like project Blue Sky, allowing employees to work on their own pet projects on the company's time, and the gift matching program, now freebies are reportedly being prepped outright. The App Discovery program allegedly sets aside a curated section of the App Store, where retail employees can log in, and download the most popular paid apps for free. It is not yet clear from the numerous report on this new free iOS apps program for Apple's retail staff, whether it will be a permanent gig, or stay in place only for the holidays. Inorite? They get paid a peasants wages, zero opportunity for advancement, benefits that would make a part time wal mart cashier laugh, have to deal with ifans all day AND now they get FREE APPS?!?!?!?!?!?!? That tears it, I'm going to quit my job and go be a cog for apple! I dunno, my fianee's brother in law works for apple, he's move up quite a bit and has gone form like $9 an hour to 14 over the last couple years, plus benefits, not bad for a college student in michigan. Wow!!!! free apps for the holidays!!! !No wonder apple keep billions in the bank, how bout giving your employees bonus money and pay increases for the holidays!!!!!!! WOW!!! How cheap is that! Microsoft gives away phones and tablets to employees for free and all Apple wants to give to their employees are apps? ?